They’re not playing with their food — because Southern Resident killer whales eat fish, not porpoises. So there must be another reason why fish-eating orcas stalk, attack and sometimes kill harbor porpoises and Dall’s porpoises, both marine mammals, according to researcher Deborah Giles, who has opened an investigation into this seemingly odd behavior. 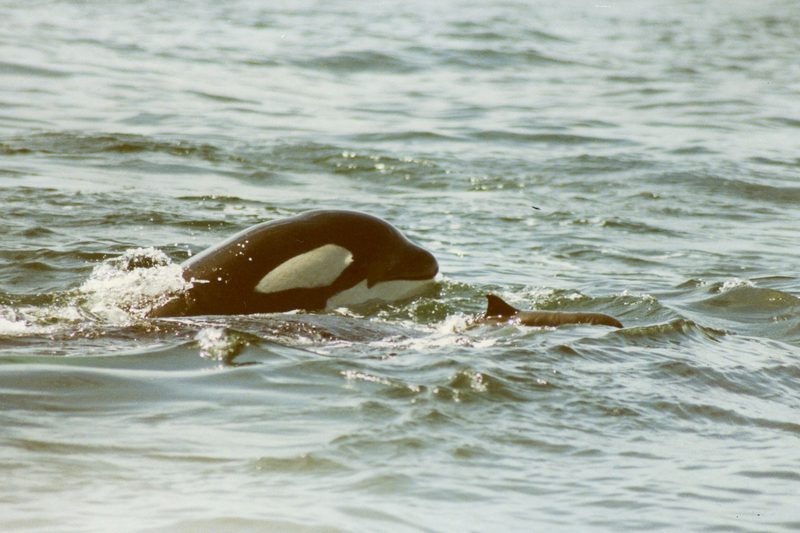 Giles, of the Center for Whale Research on San Juan Island, has discovered that the chasing and killing of porpoises has gone on since the first methodical observations of killer whales in the Salish Sea. She has looked at reports going back to the 1970s and is still gathering information from both expert and amateur whale watchers. This kind of “play” does not happen often. So far, Giles has collected 41 reports of this type of attack, including 11 confirmed deaths, over the past 40 years. When the age of the attacking whales can be determined, they are often juveniles going after young porpoises. “They may surf with them, carry them around on their pec(toral) fins and generally exhaust them to death,” she noted. Teeth marks are sometimes seen on the carcasses of recovered porpoises, caused by the whales holding them in their mouths, but bites are not taken out. Orcas in L pod, the largest of the three Southern Resident pods, have been implicated in many of these incidents in the historical records, she noted. Since 2005, however, it appears that members of J pod have been taking part in an increasing number of attacks. Giles calls it “Phocoenacide” (pronounced Foe-seen-a-side) — the killing of porpoises. That covers the scientific grouping (genus) for harbor porpoise, Phocoena, as well as for Dall’s porpoise, Phocoenoides. Why the orcas may be doing this is open to speculation, but Giles hopes to get answers by collecting more historical reports and by asking observers for any new reports of this practice. She put out a plea at the conference for anyone to contact her at giles@whaleresearch.com. The population of harbor porpoises in the Salish Sea has been increasing, with some estimates of growth at well over 10 percent per year. Could the fish-eating whales be sensing a growing competition for food from these porpoises, which also eat a lot of fish? Not likely, says Giles, because porpoises generally eat forage fish, such as herring, while the diet of orcas is made up almost entirely of chinook salmon. In fact, the young harbor porpoises that are most often attacked are not much bigger than the largest chinook salmon that the whales are consuming in Puget Sound, she said. Her speculation is that the attacks on porpoises may be a training exercise for the young fish-eating whales. Transient killer whales, which actually feed on harbor porpoises, are known to wound the animals, chase them, then toss them around before eating them. The Southern Resident killer whales are listed as endangered under the Endangered Species Act. Despite efforts to protect them, a major reason why their numbers have failed to recover appears to be a lack of salmon. It seems unlikely that these whales would begin to eat harbor porpoises, since their ancestors probably ate fish for thousands of years, Giles said. But if they were to alter their diet, she would like to have a record of their behavior leading up to that moment.